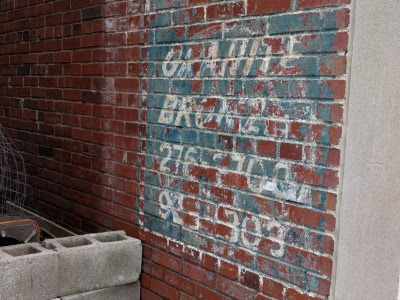 I love the old, hand-painted advertisements painted on brick that remain on many of Pittsburgh's old buildings. I think they're called "ghost signs." It was around 10 am on a Wednesday and there were only 4 other patrons. It was quite nice. I've only been there for dinner and it's always been bustling. This time, it was slow paced, leisurely, quiet. There is something wonderful about being one of a few patrons on a sunny, warm-ish March day, enjoying a late breakfast in an old building in the borough where your parents grew up. The sunlight came in through the large front window. It was comforting and as my mom talked about East Main Street and what had been where when she was growing up, I remembered being very young and visiting my great-grandpa in his tiny shoebox apartment on Third Street, I remembered family gathering at Aunt I's house on Mansfield Ave, listening to baseball games from Carnegie Park while lounging on my grandparents' back porch on hot summer evenings and enjoying banana splits. 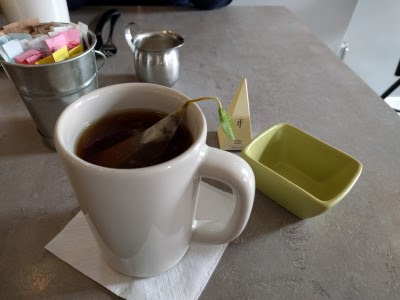 Mom enjoyed coffee and I enjoyed my Tea Forte Earl Grey tea while we waited for breakfast. 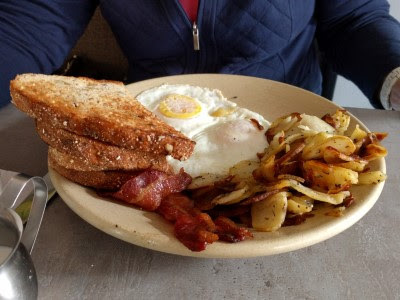 Mom opted for Two Eggs (cooked your way, homefries, sausage or Bakn, toast). She chose fried eggs, bacon, and white toast. It was a lot of food, much more than she normally eats that early in he day, so she couldn't finish it all. She said the eggs were cooked just how she likes them and she really liked the homefries. 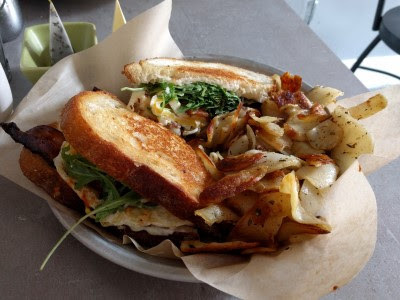 I got the sandwich I've been wanting since my first visit: Breakfast Sandwich #1 (fried egg, peppered Bakn, Jarlsberg cheese, oven roasted tomato, arugula, Baknaise on sourdough). This is still my favorite breakfast sandwich. The hearty sourdough, tangy roasted tomato, bacon and bacon flavored mayo. It's drippy and messy but worth it. As usual, I took half home for later. 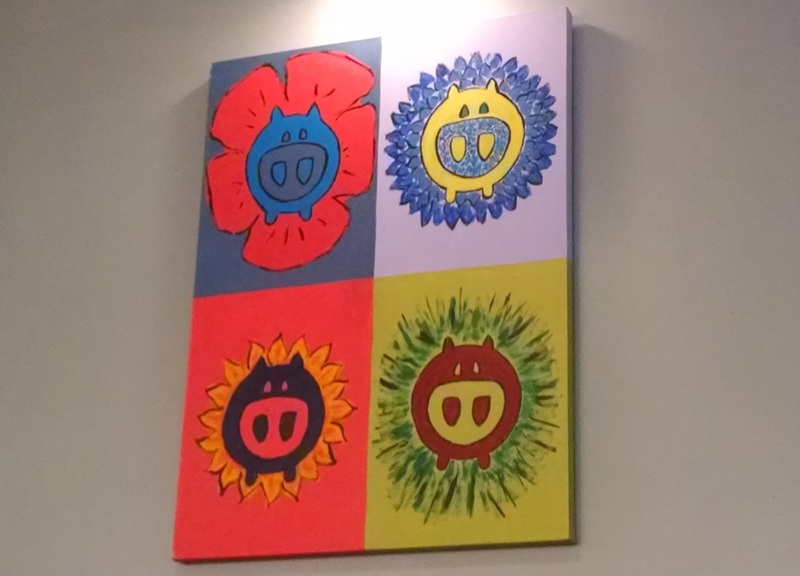 I know I've written about Bakn before, but since I went for breakfast and not dinner and since I had not before realized what the building used to be, I wanted to write about it again. Plus, mom ordered breakfast, so I wanted to share the breakfast egg photo. I still really like Bakn and the service was again friendly and prompt. That tombstone place has good eggs and bacon.